In the previous post I discussed the EGLWindow class, this class is designed as a framework for the user of the library to create consistent windows. 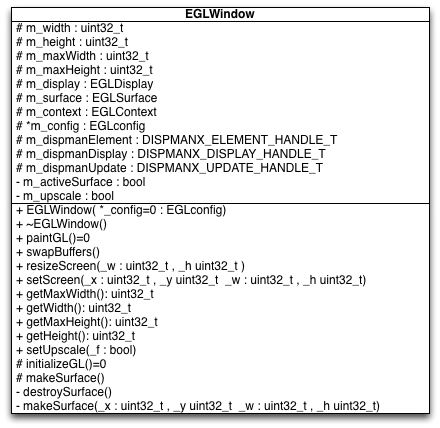 This post will look at how we can use the EGLWindow class and extend it. This class is going to inherit from the main EGLWindow class then implement the two methods initializeGL and paintGL. When using the class the constructor must always call the initializeGL method, as the EGLWindow class is called first this will mean that we have a valid OpenGL context and any GL calls are going to be associated with this context. In this example we just print out that the ctor has been called and then init gl. Next the we will create the paintGL method, this is designed to be called within our main look each time the screen needs to be updated. In this case I'm going to set the screen clear colour and clear the screen. Once drawing is complete the swapBuffers() method must be called to tell OpenGL to swap the back buffer with the front to show the re-drawn surface. The following code will create an instance of the MyGLWindow class and execute a loop calling draw. In the previous post I created an EGLconfig class to allow the creation of an eglConfig for raspberry pi. In this post I will talk about the design and implementation of an EGLWindow class which allows the user to create a window and then extend the basic window for their own drawing. This class will implement various functions to setup and create an OpenGL drawing context for the user. 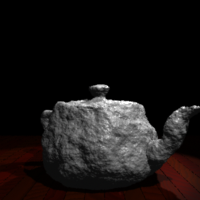 It is then the users responsibility to implement certain methods in the sub-class to do the basic initialisation of the OpenGL functions, then a drawing class which will be called each frame in the client program. The core method to this class is the makeSurface method. It will create our surface and configure internal class attributes to hold values needed for the drawing etc. It also calls the initializeGL method once the surface has been created to do one off configuration of OpenGL / class attributes. The next post will show how these classes can be used to create a simple OpenGL window. I've finally ported my graphics library ngl to the raspberry pi and I've released the source on google code. This post is going to be an introduction on getting started with the EGL window and the basic design behind the classes that have been added to pingl to facilitate this window creation. As most of my desktop NGL demos are based on using Qt, I decided to make the config and running on NGL on the pi to be similar. To that ends I decided to design the EGLWindow class along the same lines as the QGLWidget class in Qt, this would require the splitting of the configuration and the window creation, as well as using inheritance to allow the user a common interface when writing client programs. I also initially decided to write my own Mouse and Keyboard events stack but in the end decided against this as there are many pre-existing libraries around that allow the user to access this information. An in my case I will be using SDL. 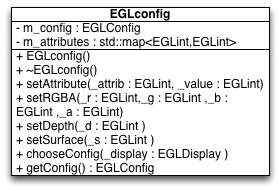 The EGLconfig class is used to store the different attributes that may be set for an EGLConfig structure. (for more details see this blog post) The class will by default setup some useable parameters and also allow the user to set their own. Finally to choose the correct config we need to pass a constructed EGLDisplay to the class. We then build from our attribute list an array of key value pairs into a std::vector terminating the list with an EGL_NONE token. This is then passed to the eglChooseConfig function to setup the correct values. The full source for the cpp file can be seen here In the next post we will create an EGLWindow class to use this. I've just written a simple wrapper for the Raspberry Pi EGL Window / Config and the video core functions, it is a simple set of C++ classes which allows the creation of windows and setting of size etc. I will write a fuller post soon, but I thought I would upload the code and a simple video now. The design is based in part on how the Qt QGLWidget works. I did some kernel tinkering earlier today and broke my main config so I decided to build two images on SD cards so I could have a stable vs un-stable boot image. The following discusses how to build an image using a mac book pro and the usual tools. I'm going to use the debian "squeeze" image from here and the terminal on the mac. As you can see there is quite a bit of space not allocated and this is a bit of a problem if you want to install lots of software to the pi. 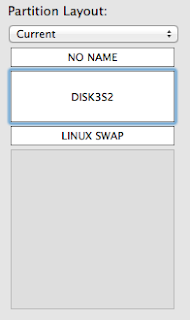 There are a number of options we can take such as creating a new partition on the spare space and use this for home, or resize the DISK3S2 partition to a larger size. I want to re-size the partition for ease of having a large home / root partition. The simplest method I've found for doing this is by using the linux gui but as I'm trying to keep this to mac / pi only I will use the method outlined here basically if you follow these instructions it works fine. In my case I've placed my username below the pi username, whilst I've left the pi user in, for security you may wish to remove this as it is a well known and documented username / password. To exit the editor use ctrl+k x to save and exit. You should now be able to login as the new user and become root. We now need to edit the config file to get the correct mouse device. My usual development cycle using the raspberry pi is to use the mac and BBEdit via SSH to edit files and iTerm to ssh to get a shell. Whilst by default you can ssh from the pi, you need to enable ssh properly to work both ways. The following will install and enable ssh on the debian "squeeze" build. On a re-boot the ssh server will now be active. To make life easier on the pi you can follow this tutorial to not require a password.